The dual flow design of the RI detector and the temperature controlled pumps of the EcoSEC High Temperature GPC System deliver precise flow rates at all temperatures, even when changes in environmental conditions occur, thus producing reproducible results sample after sample, day after day. The engineering design concepts of the EcoSEC High Temperature GPC System result in a high degree of reproducibility of retention times (Figure A) and molar mass determinations (Figure B). 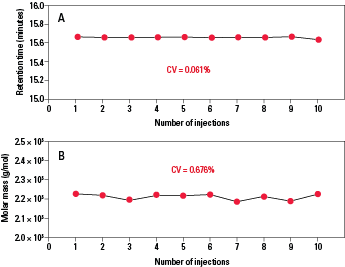 The coefficients of variation for retention time and weight-average molar mass, Mw, are well below 1% for successive injections. 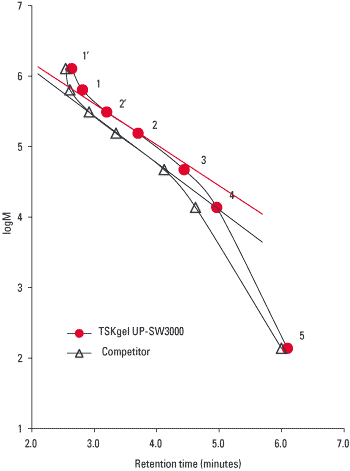 Note: In addition to solvent flowing through the sample cell, in the EcoSEC High Temperature GPC System dual flow detector, a second pump also delivers solvent through the reference cell, thus providing a higher level of RI baseline stability.